By Alan Fletcher- 30-year Carpet Expert & Trusted Consumer Advocate. You need to buy from an honest and reputable carpet dealer! With over 30-years of hands-on experience in the Carpet business, I've learned that some Carpet retailers are way more reputable than others, and some carpet sellers should be avoided at all costs! 5 stars - My Favorite! With a few remnants stood up along the back wall, some in-stock rolls of carpet on display, a neat and tidy showroom and a good selection of brand name carpet samples to choose from. These long-standing neighborhood carpet and flooring retailers buy first-quality goods directly from the carpet manufacturer, provide excellent customer service, have fair & square pricing, have knowledgeable and helpful staff and provide qualified installers. Should you ever have a problem or complaint they will do whatever it takes to ensure you are completely satisfied with your purchase. Many people love the convenience of not having to travel from store to store in search of the perfect type, color and style of carpet or flooring and prefer having samples brought to their home. It makes matching colors easier in your own home under the optimum lighting scenario. Many locally-owned carpet dealers are now offering shop-at-home services and this can a smart way to go for those who don't want to drive all around town and deal with conflicting and confusing salespeople. There are a few nationally advertised shop-at-home flooring dealers that I do not recommend because they tend to sell inferior products, have unreasonably high prices and hire high-pressure salespeople. However, I believe that "in-home carpet shopping" is a wonderful service for folks who have a hard time getting around and don't mind paying a little bit extra for the convenience. There are many reputable carpet dealers that offer quality products, knowledgeable salespeople and reasonable prices but they are harder to find today because the shop-at-home concept is just getting started. Currently, I have several reputable shop-at-home dealers listed in my Preferred Carpet Dealer Directory that I am happy to recommend, including The Carpet Guys who serve the metro Detroit Michigan area. Need Hardwoods, Ceramic Tile, Luxury Tile or Laminate Flooring? These online companies move a lot of product and can be a smart way to go if you are careful and do your homework. The biggest problem I hear about is the poor quality of the materials they offer. For example: If you buy hardwood flooring that is considered "Seconds" (cabin-grade?) it can be very difficult to install and the amount of warped, unusable or damaged product you receive can be significant and have as much as 25% waste or more. Buying first-quality hardwoods is much more costly but the outcome is much better than if you buy a "cabin grade" product. It's hard to know how much material to order when you have no Idea about the amount of unusable product they will be sending you. It can be a real nightmare when you have to re-order more materials because you did not have enough to finish the job due to the amount of unforeseen waste. You can save money buying from an online flooring wholesaler as long as you know exactly what quality or grade of carpet you are buying and know in advance exactly how the entire buying process works from start to finish. Even so, you are taking your chances because you must trust what the salesperson tell you, of fails to tell you. Shipping costs can be high too and if you are not happy with the product you order you may have to pay dearly to ship it back and also pay a hefty re-stocking fee. Some online flooring retailers are reputable and some are not, and knowing who to trust is the hard part. Even if you succeed in buying a good quality flooring at a discount, you still have to arrange for your own installation or install it yourself if you are so inclined. I suggest you read all the fine print and ask to see their return and restocking fees, and the return shipping costs before you agree to buy. 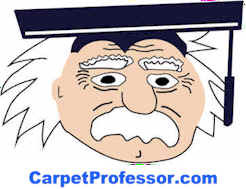 These are carpet and flooring peddlers who will send you small carpet samples through the mail. They want you to buy their carpet virtually "sight unseen" (other than a small swatch) There are no refunds on discounted carpets so you really have to be fully aware of all the fine print. You can save money if you buy from a reputable carpet wholesaler as long as you know exactly what you are buying and fully understand how the entire carpet buying process works and what is expected of you, especially regarding the delivery of the carpet and what you are required to do if you need to return a roll of carpet. Some 1-800 carpet outlets stores are reputable and some are not. The burden of being knowledgeable about your purchase falls solely upon you. These carpet dealers are often locally-owned but are hooked up with a national carpet distributor or co-op to increase their buying power and decrease their shipping costs. They usually use private labels to prevent you from comparison shopping at other carpet local stores. It is often much more difficult to get carpet specifications from these resellers, and it makes it much more difficult to comparison shop their products. Even so, you can still negotiate a fair deal if you know what you are doing and don't rely on their salespeople to make choices for you. Some carpet layers have longstanding relationships with local carpet dealers, or may have a way to order new carpet and padding at near wholesale prices from local suppliers. Carpet layers often end up with sizable leftovers from bigger carpet jobs because carpet so many salespeople over-measure their jobs. When there is a lot of carpet leftover the installer may take it home and try to sell it on Craigslist or in your local newspaper. If you find an installer who has some leftover carpet or other flooring materials available at a very low price, you need to understand that they have a limited supply of those materials and have no way of getting any more of the exact same color or style. There is no manufacturer's warranty on these materials whatsoever and no recourse if you end up unhappy with the performance. Still, you can find some real bargains this way. As with any contractor you hire to do work on your property, I suggest you check references, verify their contractors license and business liability insurance to make sure they are all current and up-to-date. This might be an inexpensive way to go if you are just doing one or two rooms or if you need to replace carpet or flooring for a rental property. If you want to do-it-all-yourself and save a lot of money... create a detailed diagram of your home with all the room measurements and bring your truck, some rope and maybe a tarp if it is raining! These local dealers offer low prices and have dozens of rolls of carpet "in-stock". They cater mostly to homeowners on a tight budget, landlords and property managers and DIY homeowners. They have plenty of inexpensive, lower-quality, defective or second-grade materials. Have them roll out the carpet before you agree to buy it to make sure there are no obvious defects. Check their guarantee carefully and get everything in writing before you sign on the dotted line. Once you buy it, you own it. no refunds. The main problem when buying carpet from this type of retailer, is that they rarely have the same type, style or color of carpet available. That means if you need to buy more of the exact same carpet you bought today, it may not be available for you to buy tomorrow. Once a roll of carpet is sold, the same type, style and dye lot (color) may be gone forever. No two rolls of carpet are exactly the same. There will be differences in color or style that may be quite obvious once it is installed. These corporately-owned conglomerates blanket the airwaves with constant and repetitive TV commercials, radio ads, billboards and bus stops! They have thousands of locations located all over the country. I think home improvement warehouses like Lowe's and Home Depot should be avoided because they use private labels, they farm out their installations to other companies, they require payment upfront at the time of purchase, and they may even charge you a fee to come out and measure your home. Should you have a carpet problem, they may just tell you to contact the installation company or contact the carpet manufacturer directly. Learn more: Should I Buy Carpet from Lowe's, Home Depot, Empire Today or Costco?